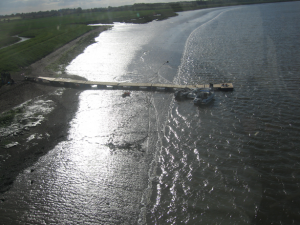 Back in 1977, it was proposed that the whole length of the River Deben be subject to a speed limit of 8 knots. The skiers at that time were forced to form a club to represent their interests on the matter and so the East Suffolk Water Ski Club was born. After a successful campaign, the speed limit was only imposed on certain stretches of the river (all of it except the area where the ESWSC now skis). In 1980, Planning permission was granted to the club for the positioning of a floating jetty, a ski jump and a slalom course on the Felixstowe side of the Deben in the only stretch of water without a speed limit. This area has become known as the skiing area. At that time, the club equipment was built by the members as funds were scarce. They built a jetty and laid out a slalom course. A ski jump was built which saw many spectacular falls on competition days. In 1986 the club managed to obtain planning permission to convert a store shed in the grounds of the Victoria public house into a changing room. This changing facility was fitted with one shower to accommodate both sexes. It would appear that the female members were a little less shy in those days. 1987 saw the association of the ESWSC and the Felixstowe Ferry Sailing Club (FFSC). This meant that the changing facilities were much improved with hot showers, the parking increased and the members could enjoy the comfort of a club bar. In 1988 a new jetty arrived as the clubs finances were looking rather healthy. In June 1989 the ESWSC took delivery of a second hand jump which it bought from a club in Grimsby. Up until 1990 the ESWSC had an agreement with the lady who owned the Slipway, this allowed us to launch our boats with no charge as long as we collected launching fees from non-members who used the Slipway. Some of the money collected was passed onto her as commission.